Back in 1998, just ahead of the first elections to the National Assembly, I wrote a pamphlet for Charter 88, an organisation then campaigning for constitutional change in Britain, entitled New Politics in Wales. This argued that the whole political landscape was changing under our feet. In particular I argued that we were entering a new era of political pluralism in which coalition government would become the norm. I predicted, too, that the Welsh Government would decentralise its operation, establishing important new offices in places like Merthyr, Aberystwyth and Llandudno Junction (pictured). I said, too, perhaps more incautiously, that Britain was turning into a union rather than a unitary state that would allow Wales more opportunities to represent itself more directly within the European Union. “With the emergence of regional structures, now within all the member states, we have the possibility of beginning to construct Europe from below in a more democratic fashion,” I optimistically opined. Growing a more civil economy – with the Wales Co-operative Centre. Transition to a low carbon economy – with Cynnal Cymru – Sustain Wales. Democratising media ownership and content – with NUJ Wales. The project is being undertaken in association with the Carnegie UK Trust which earlier this year published the findings of its Commission of Inquiry into the Future of Civil Society in the UK and Ireland, Making Good Society. 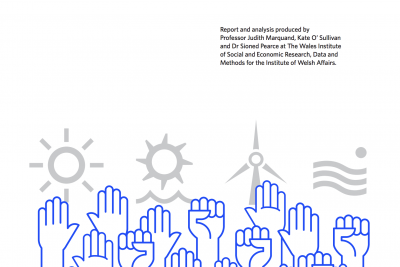 Our seminars follow the main sections of this report and aim to discover the extent of the Welsh response to the engagement challenges it sets out. In each case we have invited four expert speakers to engage the contents of the Carnegie report in presentations of ten-minutes each. Debate and discussion will follow, mediated by a separate chair for each seminar. Full details of the seminars can be found here. For me these events will be testing what I have always believed should be the main devolution dividend, the creation from the bottom-up of a functioning Welsh democracy. As I put it, in that pamphlet back in 1998, “When it first meets, the National Assembly will not be representative of [Welsh] civil society. But it will be the essential instrument to ensure that in the coming decades, a Welsh democracy and a Welsh civil society come into being.” Looking back I’m glad I put an ‘s’ on that word decade. Nonetheless, we have grounds for optimism. A very thoughtful and considered article – and an interesting reference about moving from the ‘crachach to gwerin’. The challenge is to move beyond these dated and destructive forces of Welsh elitism. What is also concerning is the lack of real cross-sectional representation in the Senedd – that goes beyond gender diversity. Surely we cannot talk in any meaningful way about ‘civil society’ if entire communities are disempowered through non-representation? If Wales is to emerge intact from the coming period of austerity, it is vital that national and local government public sector bodies and private investment agencies understand the potential of the Third Sector to act as a partner in public service delivery. It then needs to work jointly to support, build and nurture the capacity of the sector to enable it to engage. My perception is that Wales is lagging behind other parts of the UK in this respect, particuarly in comparison to Scotland where groundbreaking initiatives such as http://www.inspiringscotland.org.uk are creating long term capacity to create change. Great to say the debate in Wales is active and vibrant through this initiative.